We train the difficult dog! HAVE YOUR ATTEMPTS BEEN UNSUCCESSFUL? Apply tried and true techniques and processes. Earn your dog's respect and trust. If you do not already, respect your dog. Become the leader your dog needs you to be. 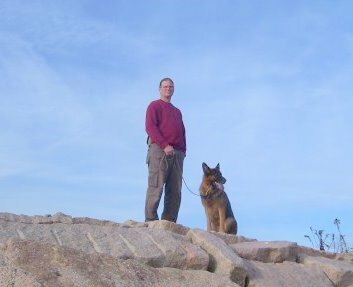 Advanced Canine Concepts is a vet recommended dog obedience trainer offering the best expert dog obedience training in eastern CT, including Old Saybrook, Old Lyme, East Lyme, Lyme, Haddam, Deep River, Essex, Chester, East Haddam, Salem, Colchester, Westbrook, Niantic, Waterford, or anywhere else desired. Contact Scott anytime. Thanks for checking out the site. For questions or appointments, please call anytime. Develop an environment conducive to your dog's feelings of safety, trust and good behavior. I often hear, "But I just want a family pet." I answer that with my approach of addressing the whole dog; that means all its behavior. Developing its environment, controlling some key patterns of behavior, establishing satiation levels and teaching and developing the owner's handling skills, as well as deepening their understanding of their dog, provides just that. My in-depth approach is appropriate for dogs of all ages, breeds, temperament and character types, as it is tempered to meet each individual's needs and creates a well-rounded, welcomed and social family member. We also specialize in the family dog.